Thomasina Montgomery was given her first opportunity to perform in public through the same venue as did many of the black musicians of her generation: the choir of her family's church. By 13 she was already performing as an opening act for established R&B artists such as Gary "U.S." Bonds and Patti LaBelle. Her talent eventually attracted the interest of producer Luther Dixon, who signed her to the New York-based Scepter/Wand Records in 1960; her debut single If You See Bill b/w It's Mine was released by the label the following year under the name "Tammy Montgomery" -- the change in her first name inspired by the popular Debbie Reynolds song. A second single The Voice of Experience b/w I Want'cha To Be Sure arrived early in 1962. Neither had much of an impact in the charts, and in her early career Montgomery's popularity was primarily centered around her concert performances. The next to fall under the young singer's spell was soul icon James Brown, who signed her to his Try Me label after witnessing a performance at the Tan Playhouse in Philadelphia. Brown assumed production duties for her third single I Cried b/w If You Don't Think (1963), while also enlisting Montgomery as a member of his touring band. A romantic involvement is said to have developed between the two during their nine months on the road together, and was reportedly brought to an end through the intervention of the still-teenaged girl's parents. In 1964 one last single was released under her family name: If I Would Marry You b/w This Time Tommorrow on Checker Records. Chart success still remained elusive, and during this period Montgomery began to consider options outside of a career in music, enrolling as a Pre-Med student at the University of Pennsylvania. She never abandoned performing entirely, however, and in 1965 the singer hit the road as part of soul "Ice Man" Jerry Butler's ensemble. Berry Gordy, and before the end of the year she was added to the Motown stable of artists. 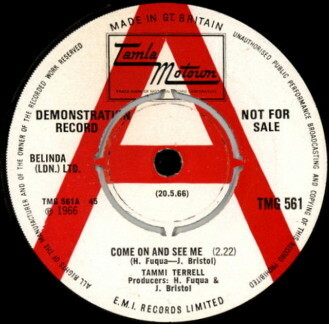 In his usual hands-on manner, Gordy required her to modify her appearance and change her stage name to "Tammi Terrell", as he felt that her future as "Tammy Montogmery" had already reached an impasse; a series of singles under this new name were produced over the next two years (I Can't Believe You Love Me, Come On And See Me, This Old Heart Of Mine, Tears At The End Of A Love Affair), but only a few managed to crack the top 40. 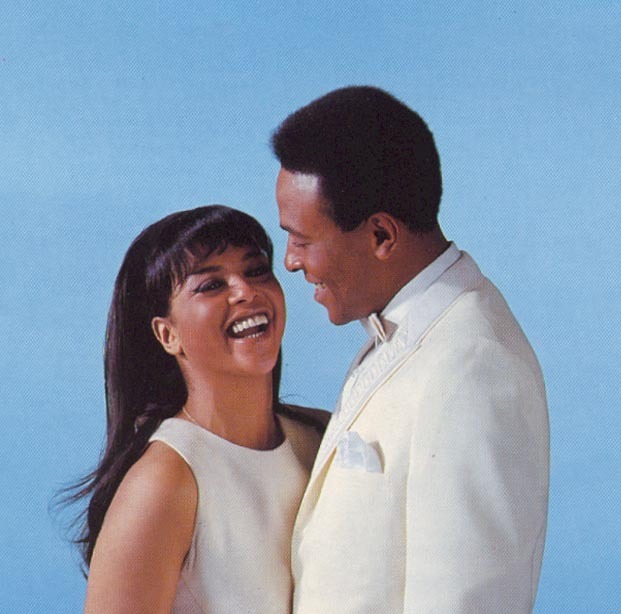 It wasn't until 1967 that Tammi Terrell finally achieved her breakthrough, courtesy of a pairing with labelmate Marvin Gaye (replacing his previous singing partner Kim Weston, who had herself replaced Mary Wells in 1964). The duo's first collaborative single, the Ashford and Simpson penned Ain't No Mountain High Enough, became an immediate hit, as did their first album United. Between '67 and '69 the duo recorded two further albums (You're All I Need, 1968, and Easy, 1969) and released a string of high-charting singles (Your Precious Love, If I Could Build My Whole World Around You, Ain't Nothing Like the Real Thing, among several others). Almost as soon as her newfound success had arrived, however, it was overshadowed by complications with her health: persistant migranes the singer had been experiencing for some time finally resulted in a collapse while onstage with Marvin Gaye in 1967, and subsequent examinations revealed the presence of a cancerous tumor in her brain. Although her illness brought an end to her ability to perform live, she continued to record with Gaye and as a solo performer (Irresistible, 1968) until it was no longer physically possible. Apparently, it was neccessary for much of the two later Marvin/Tammi albums to be created by Gaye overdubbing onto existing Terrell tracks, and a number of songs on Easy had to be ghost-sung by producer Valerie Simpson. The still very young Tammi endured eight unsuccessful operations before the tumor finally claimed her life on march 16th 1970. Devastated by the loss of his musical partner, Gaye abandoned his own recording career for a year after her death, and did not resume live performance until 1972. 1967: "Ain't No Mountain High Enough"
1968: "If This World Were Mine"
1968: "Ain't Nothing Like the Real Thing"
1968: "You're All I Need to Get By"
1968: "Keep On Lovin' Me Honey"
1969: "What You Gave Me"